CAPTCHA is an acronym for “Computer Automated Public Turing test to tell Computers and Humans apart”. It is used to determine whether or not the user is human. Many times, a CAPTCHA is an image. A human has to solve it using the challenge response system. A human can usually read it without too much difficulty. Figure below is an example of a CAPTCHA. The user has to prove that he is not a robot by writing the characters of image as an answer to the CAPTCHA. If it is correct, then the application accepts the action (login, registration, forgot password). If the answer is wrong then the user is stopped at that point and is presented with a new CAPTCHA until he answers correctly. Login: Account takeover can be performed by guessing right credentials. Forgot password: Username enumeration can be performed if the web app responses with a verbose message stating that the account exists or not. Registration: Fake accounts can be created. Also username enumeration can be performed because no application will allow two users to choose same username. Fake requests creation: Fake requests will be created that will cause overhead for the site administrator. The site admin will need to go through forms submitted by bots and humans both, so the legitimate users will be denied of service and he himself will also be denied of service. Email bombarding: Some functionalities send email to an arbitrary email address. These are also often targeted if not well protected by CAPTCHA. Thus an attacker can, on behalf of the web app, send numerous emails to internet users. Certain sites which contain very large amount of data are vulnerable to from data mining attack. 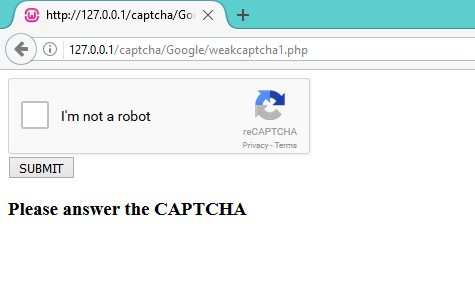 They need to protect themselves from such abuse and need a CAPTCHA implementation. Example of such sites: social networking and search engines. Why does the CAPTCHA get bypassed? In this blog, we will witness design and implementation issues. We will also see how to crack them, why they are vulnerable and how we can make a secure CAPTCHA. The CAPTCHA is nothing but an arithmetic operation that the user needs to perform. The mathematical question is in the HTML source code of the page on which CAPTCHA is presented. All the attacker has to do in this case is to fetch the source code, compute the answer and submit the HTTP Response to crack the CAPTCHA. The CAPTCHA has a limited database of questions. It is an image based CAPTCHA which cannot be cracked by reading the HTML source code and then computing answer and submitting it. But the problem lies in the limited number of questions. In the below CAPTCHA, there are only 10 challenges that keep on iterating, thus making itself vulnerable. 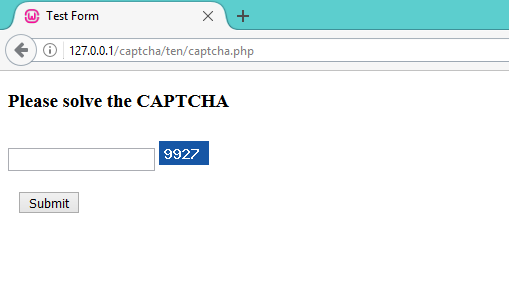 The attacker has to manually once solve the 10 CAPTCHA questions. and at the same time has to note down answers to corresponding questions. After that, a tool can be made to keep on cracking them constantly. The tool fetches the questions looks for the answer in its own database and then cracks it. The implementation issues means that the CAPTCHA can be cracked due to weak implementation, but it is perfect from design point of view. In demo, we are using Google reCAPTCHA. 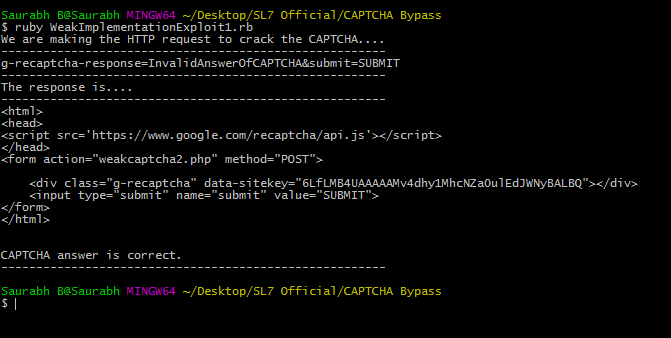 We use an API that sends the response of CAPTCHA solved by user to Google’s endpoint. More about it here: https://www.google.com/recaptcha/intro/index.html . The API replies to the request in the form of JSON output. Along with a HTTP Status code. So far so good !! But the implementation issue arises here because the developer fails to check the JSON response, but instead of that he checks the HTTP Status code which is sent as 200 OK for correct and incorrect CAPTCHA responses both. 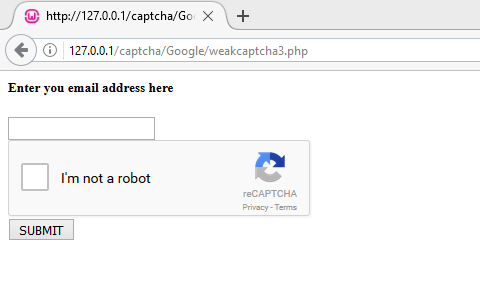 The CAPTCHA is present on the web page, but after it has been submitted, it is validated but a simple mistake in if and else clause makes it vulnerable. The mistake is that the developer writes a positive response code in the else part also. So even if the CAPTCHA answer is wrong the application will give positive response to the user. The CAPTCHA is present on the web page, but after it has been submitted, it never validated on the server side. So, by simply entering wrong CAPTCHA answer and an arbitrary value of email, an attacker can bypass it. 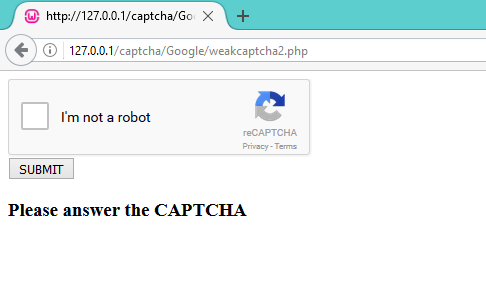 How to protect ourselves from CAPTCHA attacks? Design: Implement a CAPTCHA which is good in design. We have seen how self made designs can be vulnearble. So use a third party CAPTCHA service provider like Google. Do not check the validity of answer by HTTP Status code, instead check the JSON response sent by Google. Implement proper logic in if and else clause which differentiates between valid and invalid answers. Do not disclose your private CAPTCHA key. It is a secret. It is a business requirement to have CAPTCHA on certain functionalities. 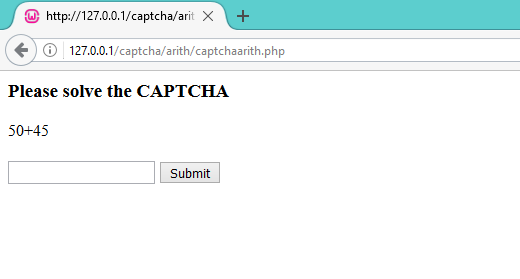 If CAPTCHAs are insecure, then this can lead to extraction of sensitive data using tools, attack on authentication, DOS to user and admins. All this will result in reputation loss for the site owner. In order to set a right CAPTCHA, have a CAPTCHA which has a good design and implement it well.